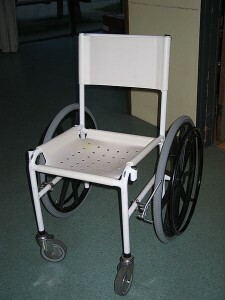 Shower wheelchairs can be an important part of day to day life for those with a disability. Bathrooms, and showers in particular, are a high risk area due to the slippery nature and awkward positions one can find themselves in. I’m sure you already know but I’ll say it again, there are literally hundreds of accidents and injury’s in the bathroom everyday. One way to help keep yourself safe while bathing is to use a shower wheelchair. This is a wheelchair that is made from materials such as PVC and aluminum that won’t corrode in the wet conditions. An added benefit of the materials used is the light weight, these chairs are very easy to maneuver. Some even have an opening in the seat to allow proper bathing even for those with very limited mobility. Before running out and pricing shower wheelchairs you should take into consideration that these will not work in a standard bathtub or standup shower. The shower area should not have a threshold or at least a very small one. The person using the chair should be able to roll into the shower with very little effort. If the threshold is too tall then it will impede the shower from moving in. Another important accessory to have is a hand help shower head. Without a standard shower-head you won’t be able to maneuver yourself around enough to rinse off. Some hand held showers will also have the ability to turn the water on and off right from the handle. You’ll love this feature if it takes you awhile to finish as the hot water will last much longer. If your not sure what it takes to build a tub that is accessible to shower wheelchairs have a look around the internet, there are a number of guides out there. The majority of shower wheelchairs are manual so the cost is usually reasonable. You can easily find something new in the $200 to $900 range depending on what type of options you have. The chairs are actually quite durable so you might be lucky enough to find a used one in the $50 to $500 range depending on the age and condition. Make sure you look any used equipment over carefully. Check that security bars and belts are firm and there are no cracks in the frame, PVC, or seat.